Horned Dorset sheep are regarded as one of the oldest and purest breeds of sheep and have been bred in Dorset and Somerset Counties on the Southern coast of England for centuries. The breed has many Downs-type characteristics, its purity of color suggests long wool breeds. Dorsets were brought to the United States from England in 1860 by Richard Scott. In 1891 the Dorset Horn Sheep Breeders Association was organized. 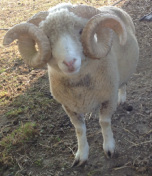 Dorset Horn rams are used as sires for prime lambs that can be marketed at an early age. They also provide a genetic resource for the Poll Dorset stud industry. The Dorset breed (both horned and polled) is by far the most popular sire in Australia for lamb production. Breed characteristics include a fine wool which is dense and high yielding. Adult ewes will sheer approximately 8 pounds of wool which has a 27 micron fiber diameter. 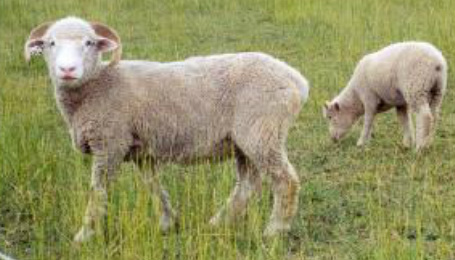 Mature ewes weigh between 150-180 pounds and rams weigh approximately 210-250 pounds. Dorsets have wool to the cheeks and to the eyes, but seldom have much wool below the eyes. 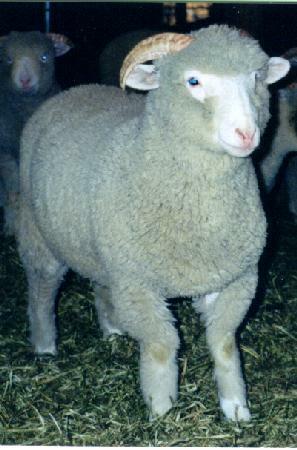 Dorsets are particularly valued for its characteristic of lambing earlier than sheep of most other meat breeds. Dorset ewes and rams will breed at almost any time of year. They are prolific breeders averaging a 150% lamb crop per year and often lamb twice a year. Dorset sheep are an extremely hardy breed of sheep and seem resistant to foot rot and most other sheep related diseases. They do require shearing, hoof trimming, and vaccinations. We have retired and no longer have any Dorset sheep.